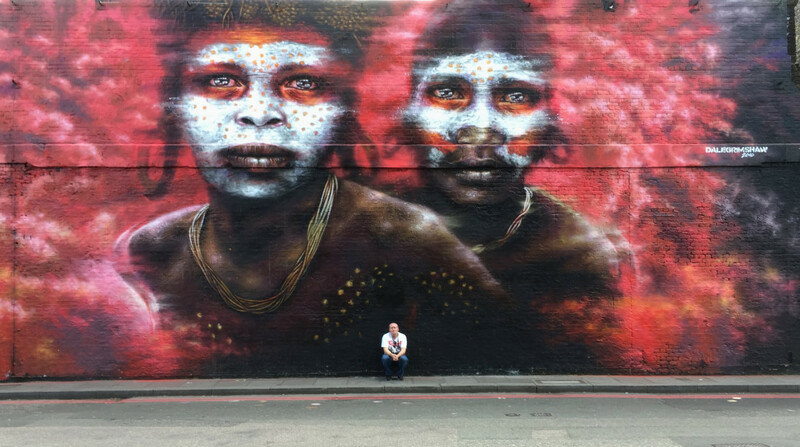 Dale Grimshaw is a painter and street artist originally from Lancashire and now based London. After an extensive gallery career Dale has recently been devoting time to street murals and has been widely recognised as one of the most powerful and talented of street artists on that scene. Over the past five years he has been invited to festivals nationally and internationally as well as painting many iconic walls across London and numerous other cities across the globe. Dale’s latest paintings are of threatened indigenous people – mostly from West Papua New Guinea, exploring the relationship between tribal people and the increasingly callous profit led world of globalisation. These figures often collide on a backdrop of familiar symbols and signs of the western world – producing a visual jarring effect that emphasizes our difference and their struggle. His work is boldly figurative and inspired by his strongly held humanitarian beliefs. Lately Dale has become involved with the political struggle to free West Papua from Indonesian occupation.This bitter and hard fought struggle is rarely reported in the West and through his work, Dale has been supporting Benny Wenda, the campaigns leader and long term champion, in raising awareness in the UK.